I have a Char-Broil grill setting in the back yard, and I am lucky enough to get to use it year round since I live in Florida. I love grilling but I am a not huge fan of charcoal flavor so my grill is gas. These recipes will work for all types of grills. 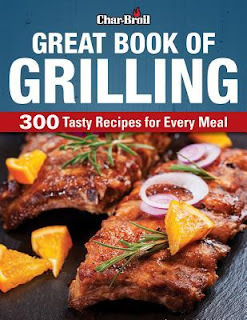 This book is the perfect book for anyone who enjoys grilling and it doesn't matter what brand your grill is. This handy guide if filled with tips and tricks for making your grilling experience more fun and easier. There are tips for smoking s well as grilling. There are great temperature guides. But the best part is the 300 recipes. There are recipes for meals from breakfast to midnight snacks and desserts tossed in also. You will be drooling while reading through this book, not just from the recipes but also from the awesome color pictures of the prepared foods.